A triple homicide in a remote Alaskan town brings together a former rodeo champion (Jon Bernthal) and a violent drifter (Christopher Abbott) in this moodily photographed neo-noir. Though set in Alaska, the film was shot largely in Hope, British Columbia – the same location as Rambo’s inaugural outing First Blood (1982). A 2 minute and 37 second oner – The camera starts in the back seat of the car with Christopher Abbott driving. He pulls into a parking lot and gets out to use a payphone while the camera continues to shoot from inside the car. 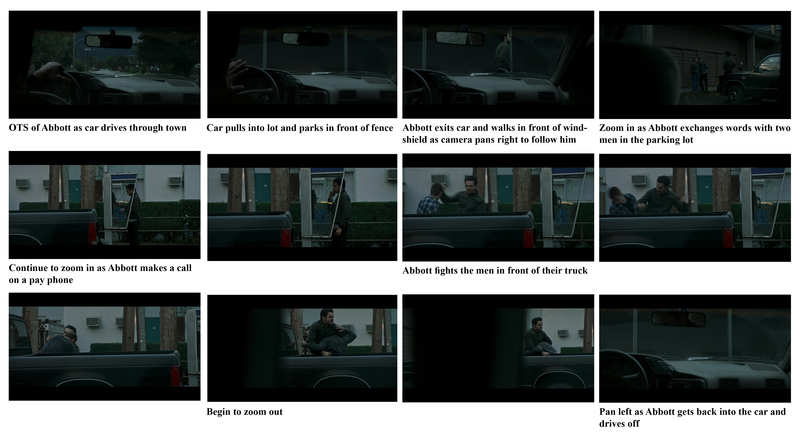 The following scenes have been broken down to include a frame from every set-up. #1) A static shot of the lawyer entering and sitting down (out of frame) at his desk. #2) An over-the-shoulder medium shot on the lawyer. #3) The rest of the scene plays out in this close-up on Poots, focusing on her reaction as she receives the news about her husband rather than cutting back to the lawyer.